Are Bishops Now Speaking out of Both Sides of their Mouths? dissents from Catholic teaching on homosexuality and is not a Catholic organization. In view of the recent booklet Marriage Equality: A Positive Catholic Approach, by Francis DeBernardo (published by New Ways Ministry), we, as the respective chairmen of the USCCB Committee on Doctrine and the Ad Hoc Committee for the Defense of Marriage, wish to reaffirm Francis Cardinal George’s statement of February 12, 2010 and assure Catholics that in no manner is the position proposed by New Ways Ministry in conformity with Catholic teaching and in no manner is this organization authorized to speak on behalf of the Catholic Church or to identify itself as a Catholic organization. Really it becomes curiouser and curiouser……..
Bishop Thomas Gumbleton, retired bishop in the Archdiocese of Detroit, has consistently been a supporter of New Ways Ministry and has encouraged homosexual priests and bishops to “come out” and be truthful to themselves and others. 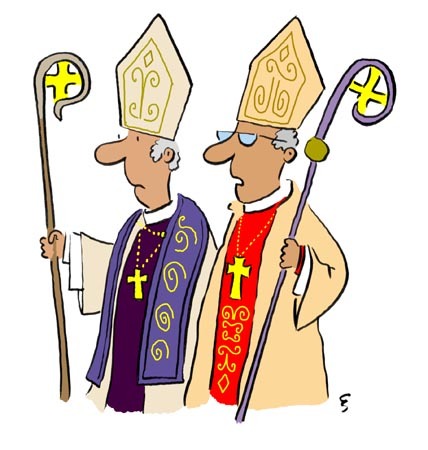 Conservative estimates suggest that about 33% of today’s Roman Catholic priests and bishops are gay. Fr. Donald B. Cozens, author of The Changing Face of the Priesthood, wrote that with more than half of today’s priests and seminarians being gay, the priesthood is becoming a gay profession. Many who know the interior of the Catholic Church would argue that the priesthood has for centuries been a gay profession. The existence of homosexual bishops in the Roman Catholic, Anglican, and other traditions is a matter of historical record. As far back as the eleventh century, Ralph, Archbishop of Tours had his lover installed as Bishop of Orléans, yet neither Pope Urban II, nor his successor Paschal II took action to depose either man. 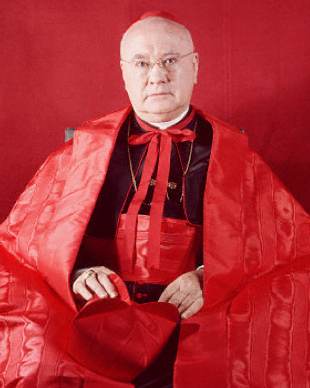 Francis Spellman, the Cardinal Archbishop of New York (died 1967) was rumored during his lifetime to have been gay. Spellman’s biographer, John Cooney, reported that many interviewees took his homosexuality for granted. A book published in 1998 claims that during World War II, Spellman allegedly was carrying on a relationship with a chorus boy in the Broadway revue One Touch of Venus. Ironically, Spellman defended Senator Joseph McCarthy’s 1953 investigations of subversives and homosexuals in the US federal government. Eugene Kennedy, a specialist on sexuality and the priesthood and a former priest, wrote in his book, The Unhealed Wound: The Church and Human Sexuality, that the Catholic Church…. It is time for bishops to “come out” and be truthful to themselves and others. Who Is Right? Is Vox Populi Vox Dei?